Welcome to Vela Dare Yachts! We are here to provide you your best travelling experience with luxury motor yachts or modern mega Turkish gullets. Where to travel with Vela Dare Yacht Charters? What are the other options besides yacht charters? Founded by a group of artists, Blue Cruise was the pioneer agency of cruising. With our solid experience of exploring the coast along with clear waters of Turkish Mediterranean, Blue Cruise has become a uniquely Turkish way of enjoying coastal sailing with gulets. Once you and your group charters a boat from Vela Dare, we tailor an itinerary for you. We briefly describe the highlights of the Turkish coast in another section. 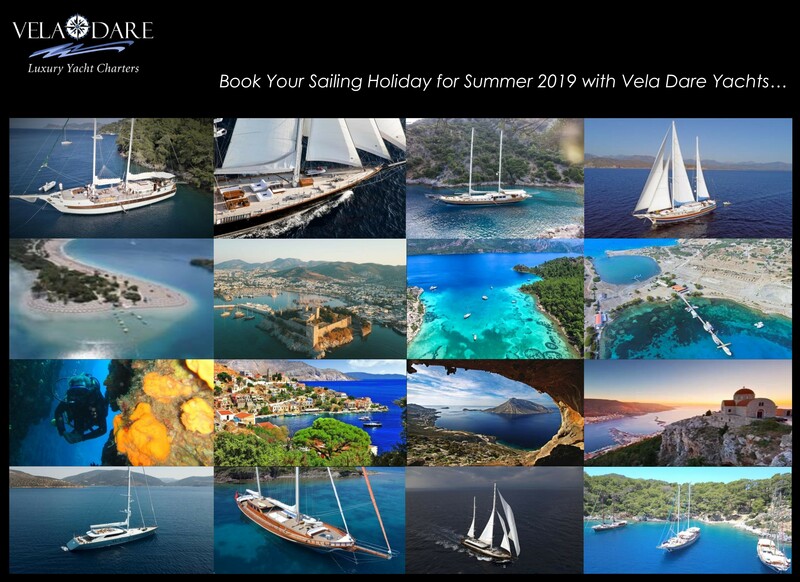 Plan your blue cruise On arrival in Turkey you will be met by an English speaking Vela Dare representative at Dalaman Airport, and transferred to your yacht or residence by air-conditioned minibus. Fascinating ruins are scattered all along the coast; Lycian tombs artistically carved into rocks overlooking the coves, where your boat is moored, turn your sailing holiday into a voyage through the largest open-air sail-in museum in the world. Unlike cruises on ocean liners, on a gulet you can explore the secluded and often deserted bays and coves of the coast. Visits to small harbours and coastal settlements offer an intimate view of local life which large ships can not replicate. This first gulet had bunk beds and a toilet fitted in its hold, and a fresh water tank on deck. Since then, the singular design of gulets has undergone a face-lift as comfort-conscious guests seek bigger and better accommodation. Today, Turkey’s indigenous sea-going vessels blend practicality and tradition in a relaxed style for sailing holiday makers. Snacks and welcome champagne will be served while we brief you about life on-board and introduce the crew. Your sailing holiday becomes unique, embellished with beautiful scenery and Turkey’s rich historical heritage.